« Pop Quiz: What’s the Most Festive Animal-Head Dish in England? As we prepare to stuff ourselves and reflect on our nation’s history, how about taking a quick hop back to the first American cookbook? 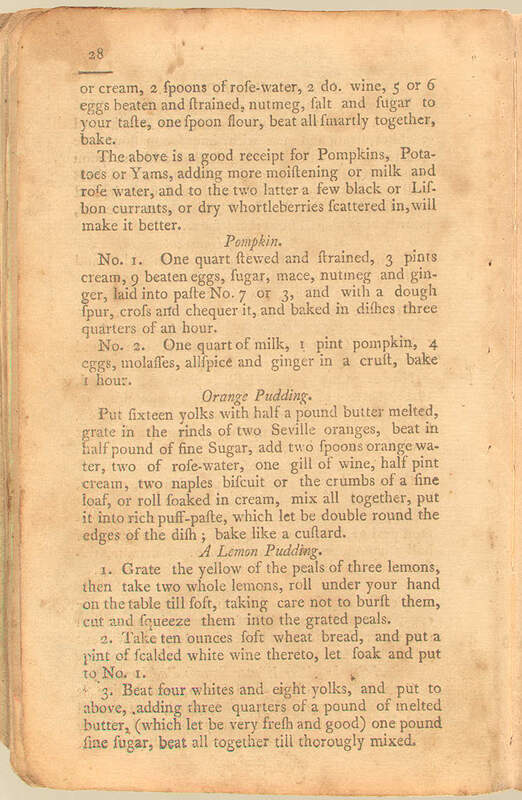 At the Library of Congress website, you can see a recipe for the original American pumpkin pie. It calls for a quart of milk, a pint of pumpkin and four eggs. Spice it up with molasses, allspice and ginger, and pop it in the oven for an hour. Yum. Plus, a bonus: A colleague of mine, Piper Evans, sent me one of her favorite easy Thanksgiving recipes. She’s a consultant for the Silver Century Foundation, an organization that promotes positive, proactive aging. To add a little nutrition to a devil’s food cake, mix in a can of pure pumpkin. “Nothing else! Really!” she says. Bake the batter in oil-sprayed muffin tins at 400 F until done, 20 to 25 minutes. What’s your favorite quick Thanksgiving recipe? Feel healthy. Live well. Smile. With our free, upbeat health newsletter. Leigh Ann Otte is the managing editor of MyFamilyDoctorMag.com and a freelance writer specializing in health and aging. This information is not meant to be individual advice. Please consult your doctor for that. See our disclaimer here. A Pumpkin Recipe a Day Till Thanksgiving–and Beyond! This entry's content reflects the opinions and reporting of the author and not necessarily that of JHMFD. This entry was posted on Tuesday, November 22nd, 2011 at 12:00 am	and is filed under Nutrition and Fitness. You can follow any responses to this entry through the RSS 2.0 feed. You can skip to the end and leave a response. Pinging is currently not allowed. Get new posts emailed to you by clicking here. Or subscribe via RSS. © My Family Doctor 2010.